What Is Municipal (or Community) Aggregation? Illinois law allows municipalities and counties to purchase electricity on behalf of residential and small-business utility customers (businesses using no more than 15,000 kilowatt-hours of electricity a year) living within their borders. Normally, customers get their electricity supplied by a utility, ComEd or Ameren. But with aggregation, communities are responsible for negotiating the price of power from a supplier other than the traditional utility. However, even if you are part of a community power deal, your utility would still be responsible for delivering that electricity to your home, and billing you for it. In theory, municipal aggregation allows communities to use the collective bargaining power of their residents to negotiate for lower power prices from suppliers. However, savings aren’t guaranteed. See the list of communities that have moved forward with municipal aggregation. Will I be Automatically Billed at My Community's Rates? Yes, unless you opt out of the program. If a community passes a referendum approving electricity aggregation, local officials will then put out a request for proposals (RFP) and select a winning bid. Then, officials may hold a community hearing to get feedback and input from residents. If a community fails to pass a referendum but still chooses to move forward, the program would be “opt in,” where residents are not enrolled until they sign up. In any case, consumers always have the option of paying their utility’s default supply price. When considering a municipal aggregation deal, compare it to your utility’s price. Note: “Prices to compare” do not include the Purchased Electricity Adjustment (PEA), which changes monthly and can be a debit or a credit. Do I have to participate in community aggregation? 2. When the utility sends customers a letter notifying them that their electricity supplier has changed. After receiving the utility notification, residents generally have 10 days to opt out.So, even if your community passes a referendum, you don’t have to participate in municipal aggregation if you don’t want to. Even if you miss these two opportunities, you can get out of a community power deal at any time. Most community deals have not charged an exit fee. But that’s a good detail to ask about when you’re considering a community power deal. Note: Since residents are automatically switched (unless they opt out), beware if a sales rep for an alternative supplier comes to your door and claims to want to sign you up for your community’s power deal. Don’t sign anything or give out your power bill or account number. This could be a dishonest rep for another alternative supplier trying to lure you away from the community power deal. Municipal aggregation deals aren’t sold door-to-door. Who Do I Call If the Power Goes Out? 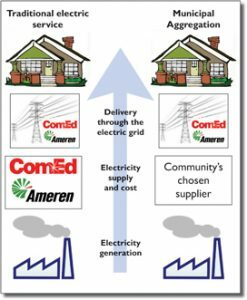 Even if you choose to participate in community aggregation, your utility—ComEd or Ameren—is still responsible for delivering the electricity you purchase to your doorstep. So if the power goes out in your home, you should call your utility. With most community power deals, if not all, consumers will continue to get a single bill from their utility. Ask your local leaders for that detail. Will Aggregation Lower My Electric Bill? Whether or not residents get lower electricity rates depends on the contract their community negotiates. If not, residents can exit the program. Always check to make sure the community power deal does not charge an exit fee. Most don’t. What Happens If I'm Already Enrolled With an Alternative Electricity Supplier? So far, most communities have separated out individuals who are already under contract with an alternative supplier. It’s wise to check with local officials to learn what the process will be. The rate you’re offered through municipal aggregation may be better than what your current supplier is offering you. If you switch, however, you may have to pay an exit fee. If I'm a Hourly Pricing or Power Smart Pricing Customer, Will I Be Able to Stay With the Program if I Opt for Municipal Aggregation? ComEd’s Hourly Pricing and Ameren’s Power Smart Pricing programs allow customers to pay hourly market electricity prices, rather than the utilities’ fixed rates. Consumers who can shift high-energy usage activities like laundry or running the dishwasher to off-peak hours, benefit the most. In fact, participants have lowered the supply portion of their power bills by an average of 15 percent. To date, no municipal power agreements or individual alternative supplier plans offer hourly pricing options, so if you would like to enroll or stay enrolled in hourly pricing, you’ll have to stick with your utility. Just like customers who are already enrolled with alternative suppliers, Hourly Pricing and Power Smart Pricing customers will likely be filtered out when residents are switched over to the community’s negotiated power supplier. Still, it’s an important detail to check. What price is the supplier offering and how does it compare with the utility’s price? While it is a basic question, it is the key question for consumers: Will I save money with municipal aggregation? Ask community leaders to be clear about the price being offered and compare it with your utility’s “price to compare,” listed in this guide. Also, find out if the alternative supplier promises to meet or beat the utility’s price over the course of the contract, as some have. Most community power deals do not charge a monthly fee, but that’s always a good question to ask, because a monthly fee can inflate the electricity rate you pay. What if I want to leave the alternative supplier? See if you can get out of a deal without having to pay an exit fee. Most, if not all community power deals, do not have exit fees. If you do want to exit a community deal, call the company listed on the supply section of your bill. What happens when my community’s power contract ends? Will my community factor energy efficiency into its power contract? Reducing power usage, especially during peak hours, reduces electricity costs for everyone. Find out what energy efficiency and demand-response measures, if any, your community plans to include in its contract with an alternative supplier. Are consultants advising my municipality on community aggregation, and if so, what fee(s) are they charging?